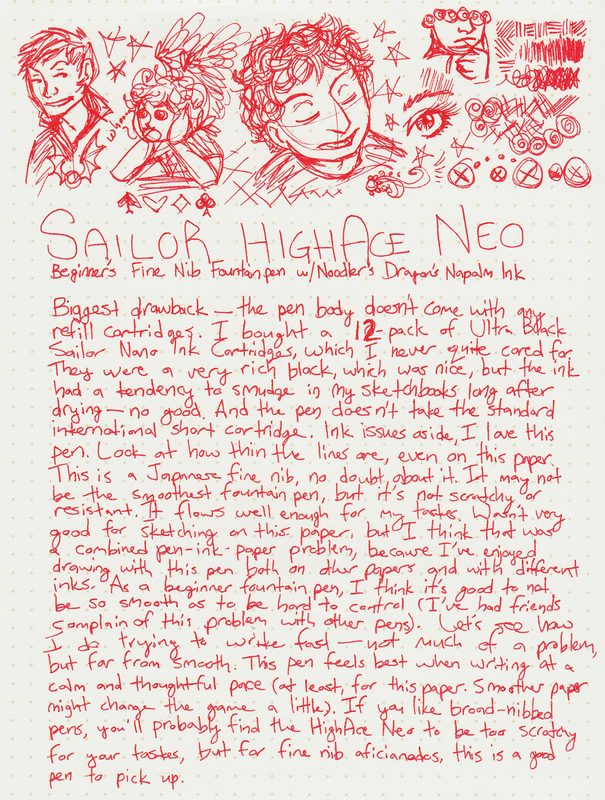 The Sailor HighAce Neo Beginner’s fountain pen hopped into my shopping cart early on in my burgeoning fountain pen addiction, sometime after I became enchanted by the Sailor Ink Bar. This was among one of the first nice fountain pens I owned. This is one of the pens I carry around in my zippered padfolio thing when I have job interviews. Fact. The design is simple but deliciously professional, a nice mix of hard, sturdy resin and metal. The only branding on the pen is on the nib, with the rest of the pen austerely unadorned. 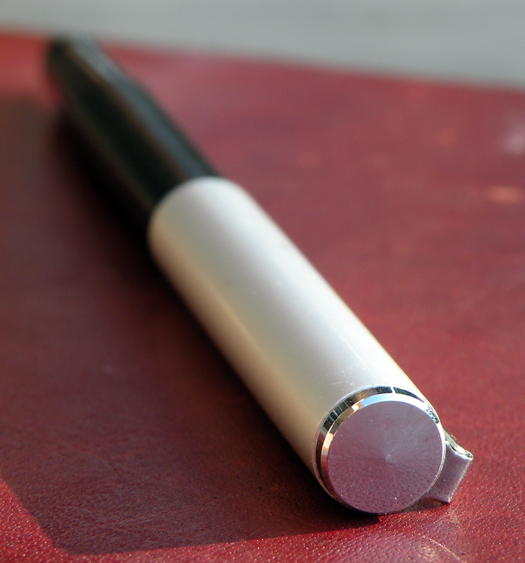 The cap snaps securely onto both ends, and gives the pen a nice little weight to it. I like having a little weight on the back end to counterbalance my grip style. Some people might find this back-heavy, but honestly, the cap doesn’t weigh THAT much. 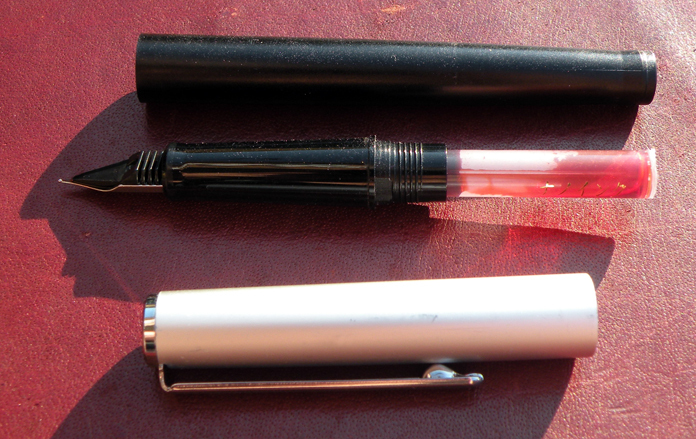 It’s a nicely constructed pen—I’ve had it maybe a year now, and it’s still looking good. Also, look at that grip, and how there’s almost no ridge between the grip section and the back body of the pen. THAT IS WHAT I LIKE TO SEE! I wish I’d taken a close up of that bit, so then I could post here a slowly zooming in .gif of the grip in a sea of majestic sparkles, set to romantic music or something. Alas, an opportunity missed. Moving on. Let me break it down for you. Literally. The one thing I don’t like at all about this pen is the cartridge situation—it doesn’t come with a cartridge, and it doesn’t take the standard short international cartridge. And the Sailor Nano Ink cartridges write a very rich black that will dry up in the pen if not used practically every other day. Go ahead and get a Sailor converter for this pen, or end up like me, syringe-filling old, cleaned out Nano cartridges. I haven’t had any drying out problems once I switched to the Noodler’s Dragon’s Napalm, so I’m blaming it on the ink. Luckily, the feed isn’t difficult to remove and clean, so if you decide, against my advice, to actually use the Sailor Nano ink, at least you know you’ll be able to clean it when the ink inevitably dries up in the pen. Like I said, no such problems with the Noodler’s ink, quite the opposite in fact—the Dragon’s Napalm takes FOREVER to dry on Clairefontaine paper when coming out of this pen. I’m gonna have to try a different ink once I use up this cartridge’s worth…maybe find some Noodler’s quick-drying Bernanke ink? I love the way this thing writes. This is a true Japanese fine nib, easily on par with any extra fine nib pen I currently own. Now, I’m using this pen almost exclusively on smooth paper, but even in my brief dealings with normal copy paper I’ve had no issues with this pen—no skipping, ink flow is consistent, I can write fast with it, writing is tactile but not scratchy, doesn’t give any resistance that would slow down my writing. Be advised: if you are a fan of broad nibs and don’t particularly care for any nib below a medium, then you’ll probably find this pen to be scratchy. I don’t think it’s scratchy, but one: I like my nibs fine, and two: I can SHOW you what a scratchy fine nib is (COUGH tachikawa comic nib fountain pen G model nib COUGH), and this is not a scratchy nib. It might be close, but I think it comes down on the nonscratchy side of fine. My thesaurus advises me of acceptable synonyms for fine. 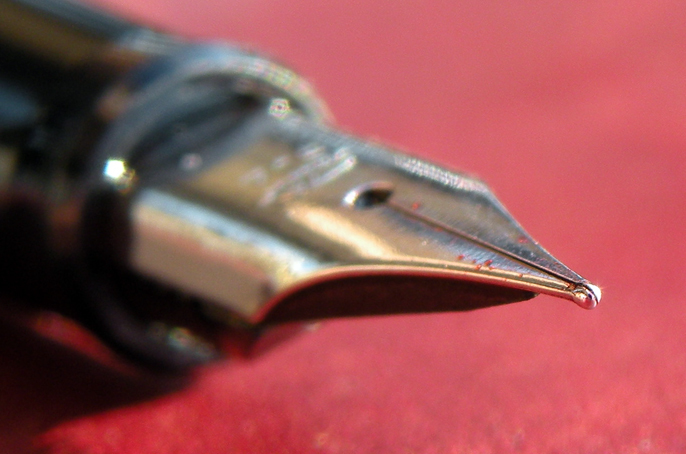 So, here's what a true cat's pajamas nib should look like. This is a good entry-level fountain pen. Slim, nicely made, holds up well, and it’s affordable. A gateway pen, if you will—a bridge from the low & expensive end (pens like the Pilot Petit 1, Pilot Varsity, Sailor Ink Bar, Platinum Preppy) on your way to the incurable addiction of fancy fountain pens with prices upwards of twenty-one McDouble Sandwiches (I assume McDoubles are used as an international unit of currency) and far beyond. Or you can rest sane and easy with some reasonably priced fountain pens, such as the likes of this Sailor HighAce Neo Beginner’s Fountain Pen. Have you seen my review of this pen? I love it but it works best with dark inks. I’m currently using Noodler’s Heart of Darkness in it and the line is crisp and precise. Flows great too. It’s a great pen for very fine work (or writing) but I prefer thicker nibs for daily use. No I haven’t tried the Muji but it looks really cool. I might just pick it up.